John Kerry falsely claimed BO to be Israel’s greatest friend and ally of any U.S. president, while simultaneously threatening to allow the UN to sanction Israel. 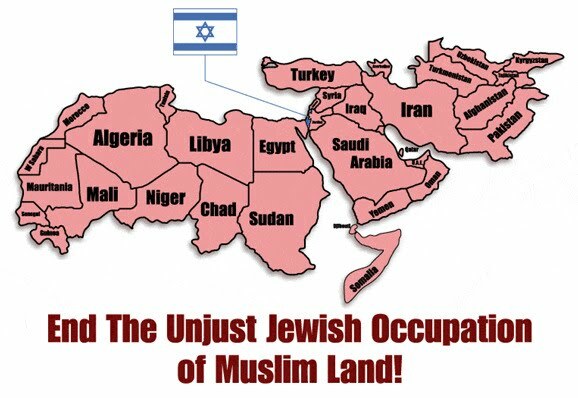 Leftarts would end Israeli occupation of Moslem lands that was sanctioned after Islamists allied with Hitler during WWII. The so-called “two state solution” to the Israeli-Palestinian conflict is as great a fallacy and fraud as global warming. Arab Moslem states have all announced their intention to destroy Israel. The best option for Israel has always been to eject the Arabs who will not live under Israeli rule, but the Arabs have been forcing America to fight against that final solution. By using the threat of UN sanctioning Israel, Obama believes he can force PM Netanyahu to bend over and kiss Obama’s backside like Christie did after Hurricane Sandy. While Christie was a weak governor who bowed before the threats of Obama’s dictates, BO’s carrot and stick approach to blackmail diplomacy to force Israel to bow to Islam has no chance of succeeding. Netanyahu is a warrior who will be all too happy to tough it out and wait for the Trump presidency. Try as he might, Obama cannot sabotage this nation and her allies to the point that a strong leader cannot flush his machinations down the toilet along with his tyrannical policies. No amount of flowery diplomatic words or declarations of alliance and reasonableness can cover up the fact that this is blackmail. This is Obama’s power play for Islam to take down Israel and put them under his thumb. Benjamin Netanyahu is no Chris Christie and he will not be Obama’s puppet to be used against Trump to undermine the American president to keep him from repairing the damage done to America and her allies by the Obama regime. Leftarts have been slandering Trump’s cabinet picks as being as unqualified for their positions as he is to be president. But we don’t forget that they elected a man of no accomplishment or qualifications whose cabinet consists of men like himself. Obama’s ideologues had no success of their own either, only ideas on how to steal the success of others. Now is the hope that Trump will flush Obama’s legacy of destruction and stifle his petty manipulations. There is no denying that Obama support for, arming and funding of the Muslim Brotherhood to overthrow Middle Eastern governments has reignited the Jihad. The invasion of Europe under the guise of refugees has been revealed to be a part of it along with the multitude of successful terror attacks Obama has permitted. The Leftarts can strive to continue to pull the wool over the eyes of the righteous, but the election of Trump proves that his deception has come to an end. All that remains is for the voice of this treacherous snake to be silenced at the end of a noose following his trial for treason. This entry was posted in Politics and tagged Barack Obama, Benjamin Netanyahu, Donald Trump, Israel, Jihad, John Kerry, Obama blackmails Netanyahu, Obama empowers the Jihad, UN Sanctions against Israel. Bookmark the permalink. Are you aware of the original agreement of the Isreal settlement immediately after WW2…in the first place..
…the Palestinian state welcomed these so-called Jews of European descent as refuge…from Hitler’s rampage…not only are they the rudest “house guest” but they are committing crimes against humanity toward the Palestinian people. 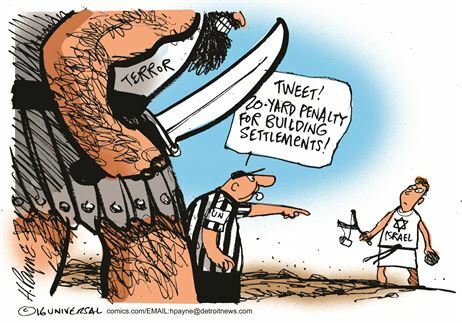 They continue to violate agreements…kind of like early English settlers broke treaty after treaty with the indigenous American Indians….there was a “law” put into place a few decades ago that restricts Isreal to build or ENCUMBER on Palestinian land…Isreal…by the demand of the EVIL Netanyahu…has violated these regulations…as he has been doing for years now…leaving innocent woman and children especially in the Gaza Strip as collateral dammage. What history did you learn? The Palestinians did not welcome them! They immediately began a war to exterminate them! Arabs did not want Jews or anyone else in “their” region who would have any power. In Islam any land that has Moslems in it should be ruled by Sharia and they see it as their right to rule or exterminate anyone who will not live by their laws. They use their own women and children as human shields and then cry inhumanity when they are killed to prey on the ignorant humanitarians who are ignorant of how those people wage war. Your understanding of the colonization of America is equally ignorant. Most natives were not friendly and waged war on anyone not of their tribe. They did not recognize the laws or rights of others including all other tribes and the colonists. I don’t have to excuse those from Europe who were greedy and warmongering when tribal cultures were greedy and warmongering and only enforced any kind of code of ethics only within their own tribe.